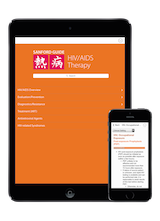 The Sanford Guide to Antimicrobial Therapy mobile app includes all the content from the print edition, plus expanded digital-only content, multi-term search functionality, calculators, tables, customizable bookmarks, and more! Of the major apps covering infectious disease, The Sanford Guide has been the top rated iOS app for over three years. Each one-year subscription includes ongoing content updates based on the latest available evidence. Sanford Guide content is stored on your device, so you'll still have access even when working in areas with no internet connection. "I loved it in print and now I love the iPad app! I always have it in the clinic with me. Very easy to use. I love the brief clinical synopsis and the drug dosing guidelines. Keep up the good work!" "Very good guide: Clear and concise, it is updated monthly." 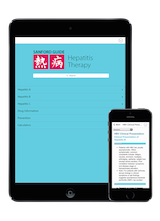 "Excellent app for most bedside ID issues with an emphasis on treatment." "If you are a doctor there is nothing better. Best doctors managing the content and easy to use. Thanks so much!" 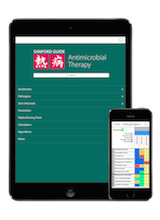 Already have an active Antimicrobial Therapy app subscription? Download the app from the App Store or Google Play, tap "Log In," and follow the on-screen prompts. Individual subscriptions are for use by only one user.